Carbon Monoxide (CO) is the #1 cause of poisonings in the U.S. Yet less than 5% of all CO poisonings are reported! The safe and efficient operation of your heating equipment and other combustion appliances cannot be determined without testing using a calibrated combustion analyzer. Because the technology, instruments, and training to do this testing correctly has only been available for a few years, odds are it’s never been done. Your service technician should be certified to properly test and diagnose potential CO exposure. Carbon monoxide, even in small quantities, can cause serious health problems, particularly in children and the elderly. Millions of unsuspecting homeowners are exposed to low levels of CO and don’t even know it. Unfortunately U.L.-Listed CO alarms don’t go off until your family has been exposed to 70 ppm (parts per million) for over 3-1/2 hours! Most international limits for unsafe levels, including OSHA and the World Health Organization’s guidelines, are between at 15-35 ppm. Carbon monoxide can come from additional sources in your home besides the heating equipment, and those sources should also be checked. They include your Water Heater, Gas Range, Gas Logs, Space Heater, and Boiler — even an attached garage. Anytime equipment is installed, it’s being exposed to conditions in which it hasn’t been tested to perform. Venting systems, combustion air, duct systems, additional appliances in the building, building pressure etc., can all affect its operation. Besides that, after leaving the factory, it’s likely your equipment has been loaded and unloaded on trucks and transported several times. Vibration and shock can cause components to shift and move. The only way to truly know if your new equipment is operating safely and efficiently is to test it once it’s been installed. They measure. If CO testing is part of the HVAC professional’s normal protocols, he or she will advise you of this prior to servicing or installing equipment. Odds are when the tech walks into you house he’ll be carrying some type of CO monitor to immediately check if unsafe CO levels are present. When working on the equipment, the tech will likely drill a hole in the flue of the appliance, and insert the probe of an electronic combustion analyzer to check actual burner performance. Additional performance testing might require holes to be drilled into the ductwork as well. Once finished testing, he or she should provide documentation and review the results with you. 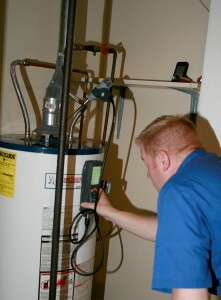 What Should I Expect From My Heating Professional? As a consumer you should expect your HVAC professional to be trained in current technology that makes sure you’re heating system is safe, comfortable, and efficient. These are probably things you may expect are mandatory, but unfortunately they’re not. The number one benefit of having an NCI-Certified CO/Combustion Analyst test your home and appliances for carbon monoxide is his or her extensive training and knowledge. The HVAC professional should be trained to measure the safety and efficiency of all your combustion equipment, even appliances that he or she doesn’t normally sell or service. Thorough testing can also verify that your equipment is operating at peak efficiency and provide the lowest operating costs. Finally, he or she should provide you with documentation that explains what has been found and what corrections have been or need to be performed. He or she should also provide you with material to better educate you about carbon monoxide sources and health effects.